The Type 3 organization is demobing and the fire is transitioning to a Type 4. Eileen Crouse is retiring after this fire assignment… She started working finance for fires in 1967! So great her last assignment was in her home village. 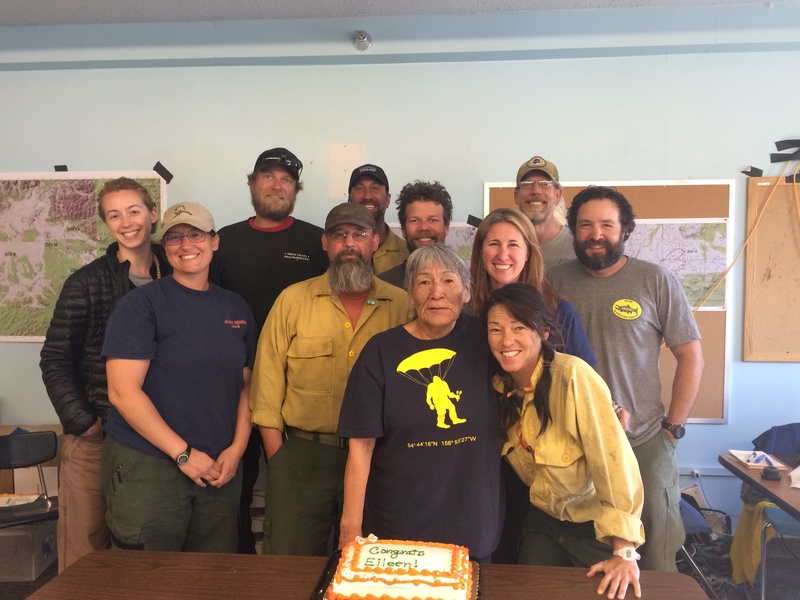 July 12, 2016 – This will be the final Alatna Complex update unless significant fire activity occurs. By the end of shift on Thursday the majority of the complex overhead and crews will be demobed. The fire will transition from a Type 3 to a Type 4 incident on 7/13. The Type 4 incident commander will be Matt Robinett. 100% containment has been achieved on the Siruk Creek (#342) and Chebanika Creek (#364) fires. The remaining crews on both fires will continue to mop up the perimeters and are working to rehab helispots. The structure protection that was in place to protect a cabin near the river has been removed since the perimeter of the Chebanika Creek fire, nearest the cabin, has been contained. The Yukon Type 2IA crew was demobed off the Siruk Creek fire today and the Allakaket Type 2 crew along with the Allakaket Squad and remaining overhead will be demobed tomorrow. The North Star Type 2 crew will also demob tomorrow off of the Chebanika Creek fire, leaving only the Gannett Glacier Type 2IA crew in the field. All other fires in the Alatna Complex remain in montior status; Bergman Creek (#323), Norutak Lake (#335), Hogatza River (#337), Tabeascot Lake (#394), Siruk Creek 2 (#398), and Hog (#399). Fire officials fly the fires every other day to monitor their status. Today’s weather was much warmer, pushing 80 degrees, and tomorrow is forecasted to be even warmer. The weather should have no impact on the Siruk Creek and Chebanika Creek fire perimeters due to the containment that has been achieved on both. However, some interior smokes may be visible as the warmer weather dries out unburned pockets of fuels. We would like to take this opportunity to thank all of the Allakaket and Alatna Tribal Chiefs, council members, and locals for being so warm, inviting, and helpful to all the firefighters and fire officials who spent the last 2 weeks in the area. All of us that were involved in the “Opportunities in Wildland Fire” presentation and helibase tour that took place yesterday, 7/11, really enjoyed seeing the excitement in the children’s eyes and sharing a bit of our experiences with them. Once again, we truly enjoyed my time here with this wonderful community. 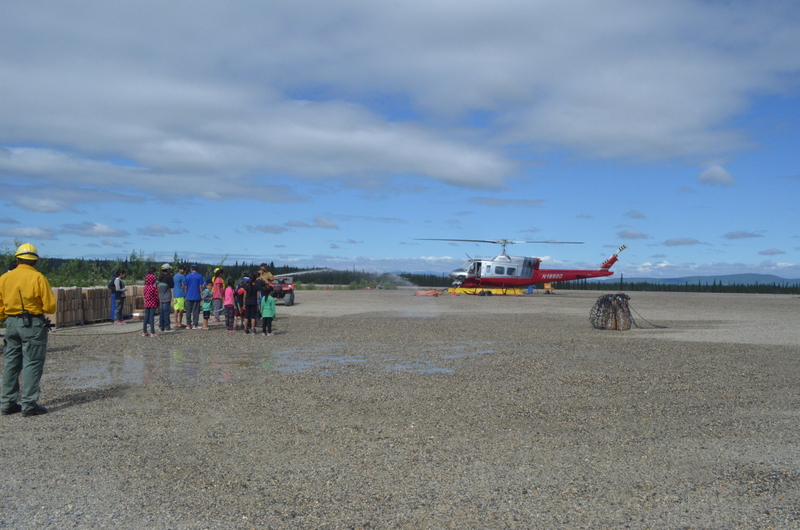 The youth of Allakaket and Alatna got a tour of the helibase that included not only a rundown of the helicopters and operations but they also built a slingload, starting a Mark 3 pump and sprayed the hose, built a slingload, and even cooked an MRE… Yum! For information about fires statewide, visit http://www.akfireinfo.com or call the Alaska Interagency Information Center at 907-356-5511. In addition, you can follow BLM Alaska Fire Service on Facebook. The Bureau of Land Management Alaska Fire Service (AFS) located at Fort Wainwright, Alaska, provides wildland fire suppression services for over 240 million acres of Department of the Interior and Native Corporation Lands in Alaska. In addition, AFS has other statewide responsibilities that include: interpretation of fire management policy; oversight of the BLM Alaska Aviation program; fuels management projects; and operating and maintaining advanced communication and computer systems such as the Alaska Lightning Detection System. AFS also maintains a National Incident Support Cache with a $10 million inventory. The Alaska Fire Service provides wildland fire suppression services for America’s “Last Frontier” on an interagency basis with the State of Alaska Department of Natural Resources, USDA Forest Service, National Park Service, Bureau of Indian Affairs, U.S. Fish and Wildlife Service, and the U.S. Military in Alaska.